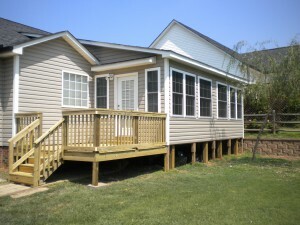 In the Charlotte and Concord area we offer some of the best pricing on site constructed sunrooms and porches. When you are ready for your new sunroom, then Good Tydings Construction is the Sunroom Contractor that you want to call. We have Service Magic that you can count on. Site built Sun rooms that blend into your home. Siding on your new sunroom to match your house. 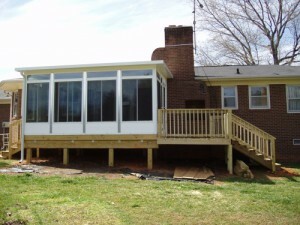 We build Sunrooms in Charlotte NC and the surounding area. We Build Quality site built Sunrooms. Constructed from the same materials that your home is built from. These are not plastic kits that are put together and do not fit with the look of your house. We use quality lumber, drywall, windows, siding, roofing and doors. Because Tydings Construction uses standard quality building products our rooms can be painted to match your home. The exterior can be Brick, Hardie Plank, Vinyl Siding or any siding to match your House. You are not restricted to the colors of aluminum and plastic kits. Our sunrooms can be built at prices that are competitive or lower than most quality kits. When searching for a Sunroom Contractor in North Carolina there are many choices. G.T.C. Home Remodeling is just one of your choices. G.T.C. Home Remodeling builds custom Sunrooms throughout North Carolina. Custom Patio Rooms, four season rooms, solariums made on site from the same materials as your home to blend seamlessly into your home. With G.T.C. Home Remodeling your Sunroom will look like it was built when your home was built. Sunrooms add living space to your home. G.T.C. 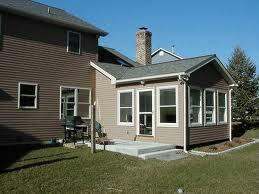 Home Remodeling as your Sunroom Builder will add quality living space to your home. Living space that will add value to your home. The better your new room addition fits into the style of your home the more it will increase the value of your home. With custom sunrooms the siding material will be the same as on your house. The windows will match the windows that are already on your home except there will be more to let in more light. The slope of your new room’s roof can match the slope of the roof on your home. Gutters can match your existing gutters. Add a deck or patio to your new sunroom to preserve your outdoor living area. G.T.C. Home Remodeling can build you an Outdoor Kitchen to complement your new Sunroom. Entertaining with your new sunroom and outdoor kitchen would be a breeze. With a custom sunroom from G.T.C. Home Remodeling you could have a fireplace. Recessed and track lighting can be installed in your new room. Ceiling fans and skylights are possible. Your custom sunroom can be built in any size or shape that you desire or your budget can afford. In most cases custom sunrooms from G.T.C. Home Remodeling costs less than factory manufactured sunrooms. North Carolina Sunroom Contractor G.T.C. Home Remodeling would be the perfect choice for your new sunroom addition. With quality craftsmanship, dedication to service and pride in the finished room G.T.C. is the right choice for you. Choosing Replacement Windows can be a daunting experience. Double hung, single hung, casement, low e, vinyl, aluminum, or wood. How do you choose? Double hung means that the top and bottom sashes both are operational. With single hung windows only the bottom sash works. Casement windows operate with a crank. Sliding windows opperate sid to side. Vinyl replacement windows are the most popular and require no maintenance. They come in a variety of colors to match the interior or exterior of your home. Some companies make windows with one color on the inside and another on the outside. Aluminum is another choice. Again aluminum needs no maintenance. Some aluminum windows have wood interiors that can be painted or stained to match your interior of your home. Wood windows require regular painting. They can also warp and crack. But properly maintained they can last for years. Lowe is an insulating factor to prevent the transference of heat. This will help with heating and cooling costs. Low e is a good choice and well worth the additional cost. On sunrooms the windows are traditionally sliders. If the windows on the rest of your home are single or double hung then the casement windows may not fit with the look of your home. Custom built sunrooms can be built with any style of windows you want. Replacement window costs vary by style and size. But a standard size window that costs less than $300 with installation probably won’t be a very good quality. Finding a window installer can be as hard as choosing windows. They are everywhere. Companies vary greatly. Some companies have an owner, salesman, and installers. These companies usually charge more due to the fact that there are so many people to pay. Other companies the owner, salesman and installer are all the same person. These companies sometimes have better pricing. Very few companies actually make their own windows most companies get their windows from a manufacturer. For Replacement Windows in Charlotte, NC Tydings Home Remodeling is the company you need. 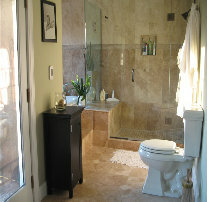 Home Remodeling for Charlotte, Concord and the surrounding area.